Five years ago, a new state law was passed that expanded opportunities for people to have criminal convictions expunged from their records. Prior to Ohio Sen. Bill 337, which became effective on Sept. 28, 2012, those with more than one conviction and people convicted of nonsupport of a dependent were ineligible for record sealing. Before the bill became law, only first offenders could have criminal convictions expunged. Senate Bill 337 allowed those with two unrelated misdemeanor convictions or a combination of one felony and one misdemeanor conviction to apply to have their convictions sealed. Since then, Ohio attorneys have continued to see an influx of clients hoping to start over and rebuild their lives through expungement. “When the law was changed to allow two convictions, it changed the way people are seeing those with a criminal record,” said Dawn Spriggs, supervising attorney at Community Legal Aid, a nonprofit law firm that serves the legal needs of low-income people in central and northeast Ohio. According to a 2009 U.S. Department of Justice study, people with criminal convictions of any kind were 50 percent less likely to receive a job offer. Past-due child support is a common issue Community Legal Aid attorneys see for expungement requests. “If a parent can’t get or hold a decent-paying job, how is he or she supposed to make child support payments? It’s a vicious cycle, and the child becomes the victim,” Spriggs said. 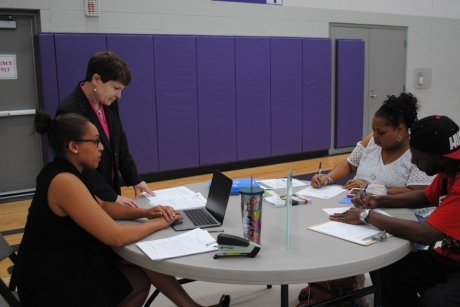 More than four years ago, volunteer attorneys and Akron Law students began a monthly outreach event to help low-income Akron residents who have criminal pasts get their records sealed. Besides expungement assistance, those with criminal convictions can also apply for a Certificate of Qualification for Employment (CQE) during the Saturday events, which attract between 100 and 200 people per session. The University of Akron School of Law’s Reentry Clinics prepare Akron Law students for a career in the public sector while assisting with expungement and other issues that often go hand in hand with criminal records. Expungement clinic volunteers conduct background searches, develop relationships with clients and represent the client in court. If a client doesn’t qualify for an expungement clinic, they may be eligible for a CQE. A CQE doesn’t seal a criminal record, but is a court-issued certificate that allows a prospective employer or professional licensing authority to employ or license an ex-offender who holds the certificate. “I consider the CQE to be the most exciting piece of legislation,” said Sahl. “People with more than two convictions previously had no hope. Having a job is one of the key factors in not recidivating. The CQE says you’ve been rehabilitated and aren’t a risk to hire. An employer isn’t a risk for being sued. Clients applying for a CQE fill out an online application stating why they are not a hiring risk. The application is sent to the Ohio Department of Corrections. The court seeks input from the prosecutor and an ex-offender’s victims for input in deciding whether to issue a CQE. Heather Staab, assistant clinical professor at Akron Law, said all Ohio licensing boards must consider the CQE. Often, a client qualifies for both expungement and a CQE. The other reentry clinics at Akron Law are the Clemency Project, which trains students to handle pardon applications to the governor, and the Human Trafficking Clinic – which helps victims of human trafficking destroy their criminal records for solicitation or prostitution. Meanwhile, the majority of people who show up to the expungement and CQE clinics have yet another problem to contend with -- a suspended driver’s license. “If you don’t have a driver’s license, you have one heck of a problem,” said William Dowling, an Akron attorney who heads the new VALID (Volunteers Assisting Licensed Individual Drivers) Clinic. “You can’t cash a check. You can’t get a job. So the idea was born to have volunteer lawyers trained to go through the bureaucracy of getting people’s licenses back. That process can be mind-boggling, and often costs hundreds and thousands of dollars in multiple courts. We started holding clinics. VALID Clinics are held with the law school’s reentry clinics.